Wondering what to see and do in India in November? November is an excellent month to visit India. The weather is starting becoming cooler and drier, and the full moon at this time of year -- in the Hindu month of Kartika -- is considered to be particularly auspicious. You'll find fairs and religious celebrations happening all over the country. Here's the pick of what's on in November in India (listed by date), including both famous and lesser-known festivals. This festival, celebrated at an ancient and secluded snake temple in Kerala, is sure to leave an impression. The unusual temple is a pilgrimage center for devotees of serpent gods and has Brahmin woman chief priestess. The temple's multitude of snake idols are taken out in grand procession to the Brahmin ancestral home, where special prayers and offerings are made. Where: Mannarasala Sree Nagaraja temple, Harippad, Alleppey district, Kerala. Organized by Nada Yoga School every year since 2008, the International Yoga and Music Festival features 50 of the best professional yoga teachers, Ayurvedic doctors, nad yogis, yoga lecturers, musicians, and philosophers from Rishikesh and abroad. Free classes and lectures are held with topics including yoga asanas, shatkarma, Ayurveda, philosophy, and Indian classical music. There's an Indian classical music concert in the evenings as well. This festival showcases the Kutch region's culture and heritage, although it's become rather commercial and overcrowded. The days are filled with folk dances and music, adventure sports, handicrafts, food stalls, and excursions to surrounding destinations. Hundreds of luxury tents are set up on the fringe of the white salt desert to accommodate visitors. Gujarat Tourism offers package tours. When: November 1, 2018-February 20, 2019. It's best on full moon nights to see the moon shining on the salt. (November 23, December 22, January 21 and February 19). Like handicrafts and want to get off the beaten track in West Bengal? Head to Bankura, known for its terracotta art, to do some shopping at this rural fair. It's organized by the artisans to celebrate their craft-making tradition. You can tour the village and meet the artisans at work in their homes, participate in workshops, and learn about the heritage of the craft at the Folk Art Center. Bankura has been developed as a rural crafts hub by the Government of West Bengal and UNESCO. Where: Panchmura village, Bankura district, West Bengal. It's about four hours from Kolkata. Postponed due to local government elections. This long-running annual cultural festival takes place at one of India's top tourist destinations. It features a program of dance, drama and music. In addition, a Hampi by Night heritage walk operates during the festival. Other attractions include a sound and light show, helicopter rides, adventure and water sports, rural sports, and a food market. When: November 3-5 every year. 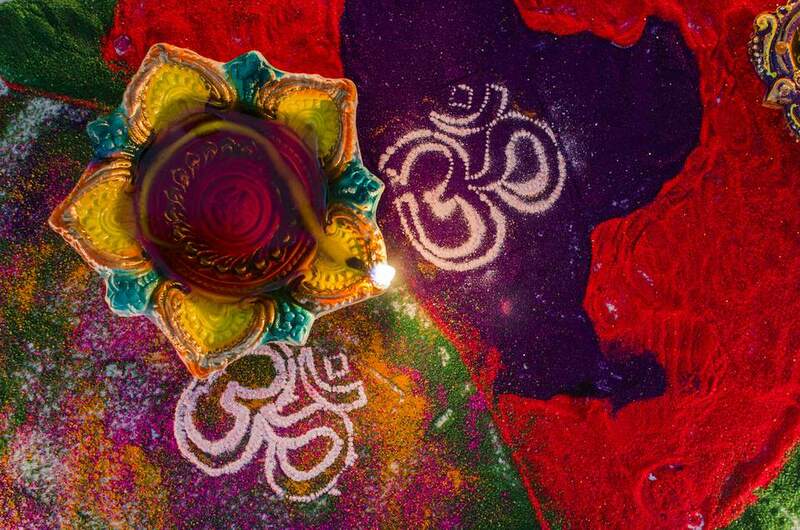 Diwali, the biggest festival in India, honors the victory of good over evil and brightness over darkness. It celebrates Lord Ram and his wife Sita returning to their kingdom of Ayodhya, following Ram and monkey god Hanuman's defeat of demon king Ravan and rescue of Sita from his evil clutches (on Dussehra). Lots of small clay lamps (called diyas) and candles are lit and placed in houses, and fireworks are let off everywhere, giving Diwali its name as "Festival of Lights". When: November 7, 2018. It's observed a day earlier in south India, on November 6. Where: Throughout India, except in the southern state of Kerala. When is Diwali in Future Years? Also know as the 100 Drum Wangala Festival, this is the biggest harvest festival of Meghalaya's Garo tribe in northeast India. Held in honor of the Sun God of fertility, the festival marks the end of the sowing season and agricultural year. It's celebrated by the beating of drums, blowing horns, and traditional dancing. Festival highlights include a traditional dance competition among Wangala troupes from the Garo Hills, slow-cooking competition, indigenous games, and handloom and handicrafts exhibition. When: Second week of November every year. This north Indian festival, traditionally celebrated by the people of Bihar, is devoted to worshiping the sun. People flock to the water's edge to offer prayers to the Sun God at sunset. Hymns and folk songs are sung, and women fast and pray for the well being of their family and friends. When: November 13, 2018. (Chhath Sandhya Argh evening prayers). Where: Across India, particularly in Bihar, Uttar Pradesh, Odisha, Assam, and West Bengal. The banks of the Ganges River in Varanasi are another excellent tourist place to see it. A Chhath Puja also takes place on Juhu beach in Mumbai. India has joined Washington D.C. in the USA, and Japan, in having a cherry blossom festival. It features a wide range of events, as well as the beautiful cherry blossoms of course. These include guided night walks, live music, folk and tribal dance performances, storytelling sessions, and stalls showcasing local wine and crafts. All events are free! This increasingly famous festival sees an astonishing 30,000 camels converge on the tiny desert town of Pushkar. The camels are dressed up, shaved, entered into beauty contests, paraded, raced, and traded. An entertaining sight indeed! Do arrive a couple of days before the official starting date to catch the most camel trading action. When is the Pushkar Fair in Future Years? The International Hot Air Ballooning Festival is an added attraction at the Pushkar Camel Fair. Similar to the Taj Balloon Festival in Agra, it's hosted by Sky Waltz, and features hot air balloons from around the world and a Night Glow Music Concert. Accommodation and balloon flight packages are offered for visitors. When: During the Pushkar Camel Fair. The third edition of this festival, dedicated to the revered 15th century mystic poet Kabir, offers an immersive experience of his teachings across a two day program. The festival aims to promote the "oneness amongst diversity" expounded by Kabir. It encompasses music, history, literature and the arts. Pingla is another part of West Bengal that's been developed as a rural crafts hub by the Government of West Bengal and UNESCO. The specialty there is Patachitra painting. It's done on cloth, textiles, stationery, and home decor items. During the POT Maya festival, the whole village of Naya transforms into an art gallery. There's also a Folk Art Center dedicated to the craft. When visiting Naya, you can also see the mat weavers hub at nearby Sabang. Where: Naya village, Pingla, West Bengal. It's about three hours from Kolkata. Suitable for both couples and singles, this festival has a line up of renowned international Tantra teachers and healers. It consists of different Tantra and Biodanza workshops every day, a healing temple, live traditional music from Baul musicians, DJs and dance parties, Osho active meditations, Love Lounge, and sacred ceremonies. The theme this year is "Divine Archetypes", and there will be daily special meditations and transmissions to anchor them to the body. When: November 19-24, 2018. This is followed by an optional two day Living Tantra experience of co-habitating in a Tantric community. Where: Zorba the Buddha Center, Delhi. Held along the banks of the holy Ganges River, the Ganga Mahotsav features cultural programs of classical music and dance. A 10-day national craft fair is also organized. The highlight of the festival is on the last day, when more than a million clay lamps are floated down the river at dusk amidst chanting of Vedic hymns as part of Dev Deepavali on Kartik Purnima. The largest fair of Bikaner district, in India's desert state of Rajasthan, the Kolayat Fair combines a huge cattle fair with a pilgrimage to the town's holy lake. It's quite a spectacle as buffaloes, camels, horses and cattle are traded, and pilgrims bathe and float clay lanterns in the lake. Where: Kolayat, near Bikaner, Rajasthan. Cattle market meets mass bathing ceremony at this regional equivalent of the Pushkar Fair. The Chandrabhaga River is holy to Hindus and it attracts many pilgrims who come to take a bath on the occasion of Kartik Purnima. The fair is also quite a big one, with buffaloes, camels, cows, bullocks and horses on sale. Rajasthan Tourism organizes cultural events as well. Here's a first in India -- a festival in am exclusive 1,800 acre private forest! The festival aims to curate an experience that will take you back to your childhood, when it was all about being outdoors. Activities include classes such as yoga and meditation, adventure activities, and games. Top local and international music acts will also perform. There are various options for tickets and accommodations, including rooms and tents. Where: Kikar Lodge, Shivalik foothills, Punjab. This modern and contemporary art fair aims to provide a cultural bridge between Indian artists, art galleries, art collectors and connoisseurs. The artworks on display will include paintings, sculptures, drawings, installations, photographs, and video and digital art by over 400 artists. Seascapes, landscapes, rural and urban scenarios, and abstracts will all be featured. Entry is free, and various workshops and panel discussions will also take place. Love pottery? Don't miss the annual Potters' Market, which is back for the eighth edition this year. A total of 43 noted potters from across India, who have all made significant contributions to ceramics and studio pottery, will be in attendance. Star exhibitors will be Delhi-based Rachna Parasher, Kristine Michael, and Dipalee Daroz. Highlights include live demonstrations, interactive workshops, and presentations. The market is supported by Jehan Numa Palace Hotel. Where: Gauhar Mahal, Bhopal, Madhya Pradesh. A festival celebrated by Hindus in Tamil Nadu and Andhra Pradesh, Karthigai Deepam takes place in a particularly spectacular way in the holy town of Tiruvannamalai. On the evening of Karthigai day, a huge fire lamp is lit high up on Mount Arunachala. Pilgrims come from far and wide to walk around the mountain, and to pray to Lord Shiva. It's believed that Lord Shiva appeared as an endless flame of light before Lord Vishnu and Lord Brahma. Hence, oil lamps are lit in homes as well. When: November 23, 2018. (The festival starts 10 days prior to this, and there are daily street processions of various gods. The gods are also taken out on floats for three days after the main day). Guru Nanak Jayanti is a commemoration of Guru Nanak's birthday (he was the founder of the Sikh religion), and is widely celebrated throughout Punjab but especially so at the Golden Temple in Amritsar, the main shrine of the Sikhs. On the eve of the festival, Amritsar comes alive with a huge procession, accompanied by singers and musicians. Part of it features a demonstration of Sikh martial arts. The beautifully illuminated temple is an incredible sight to behold at this time. The Bali Jatra (voyage to Bali) festival commemorates the ancient era of maritime exploration and trade in Odisha, which saw merchants reach as far as Bali in the 2nd century BC. When the northeast monsoon wind shifted direction around Kartik Purnima, the merchants would set sail for Indonesia. Nowadays, families place paper boats with oil lamps in the water at sunrise and watch them sail away. This vibrant rural fair combines spirituality, sexuality, and animal trading. Street magicians, religious gurus and tantriks, pilgrims, snack stalls, handicrafts, amusement rides, circus performers, and dancing girls all create a carnival like no other. The main event takes place at the intersection of the Ganges and Gandak rivers, when masses of pilgrims bathe at sunrise on Kartik Purnima. When: For a month, starting November 23, 2018. (Make sure you arrive by November 22 so you can see the devotees bathing on November 23, which is Kartik Purima). Where: Sonepur, near Patna in Bihar. The Matsya Festival, albeit little-known, showcases Rajasthani culture and heritage at its best. Attractions include exhibitions, competitions, sports, processions, folk music, and a heritage walk. The festival gets its name from the fact that Alwar was once part of the ancient Matsya Desh (Land of Fishes) kingdom during the time of The Mahabharata. Bundi is a picturesque spot in the Hadoti region in Rajasthan. The Bundi Utsav brings it alive with the culture, folklore, traditions and craft of the region. The festival commences with a procession, and features an arts and crafts fair, traditional rural sports, cultural exhibition, and folk/classical music and dance program. There's even a turban competition. Fireworks cap off the festival.